Brian was appointed as a full time Conservation Officer in 1980. Over the past 20 years, he has had 4 different postings and is presently stationed in Sudbury, Ontario. He has spent his entire career as a Conservation Officer, the last 10 as a canine handler. In the early 1980’s he helped with the original wild turkey transfers into southern Ontario, and helped to coordinate the enforcement staff for the first wild turkey hunt in 100 years in Ontario. Brian has been a Use of Force Instructor for a number of years; he has served on several Ministry committees, including the Uniform Committee, the Vehicle Committee, the Recruitment Committee and others. But he is probably best known across North America as Ontario’s Natural Resources Canine Pioneer. 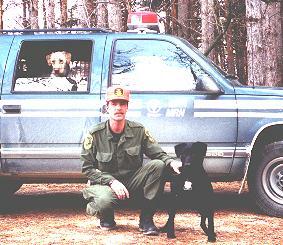 In 1981, Brian obtained dogs on his own and began training them for natural resources detection. He travelled to the United States in 1983 and 1984 for police service dog training courses. He put a huge effort in training, both on courses and on his own time. He spent the next 7 years travelling across Ontario promoting the idea for a canine unit. He tested several breeds of dogs and despite ongoing resistance from management, Brian forged on. In 1990, Brian obtained a black Labrador retriever as a family dog. Brian thought a hunting breed might be better accepted by the managers. He convinced the agency to establish a trial detector dog program with his personal dog. That year, he and his dog “Shadow” attended the Ontario Provincial Police dog training program. After two years and a number of success stories with natural resource cases and a number of others with other law enforcement files, in 1992, the detector dog program became permanent. Brian’s tremendous efforts and influences have assisted many other agencies in the implementation of their canine units; these include Saskatchewan, Manitoba, Fisheries and Oceans, Canada Customs and the Sudbury Regional Police. In fact, Canada Customs credits Brian with selecting 7 detector dogs for their agency, a feat unmatched by any of their own handlers. 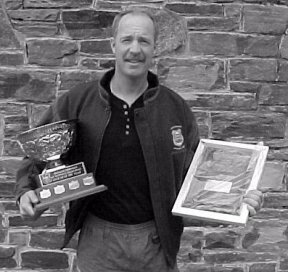 Despite the demanding role Brian has had in the development and maintenance of the canine unit, Brian has found time throughout his career to find time for his Officer Association, where he has been an active member, particularly with the newsletter. Brian’s involvement with community and family are similar to many officers’, with the exception of an incident that occurred in late 1999. Many officers are aware of the accident that happened that winter which hospitalized NAWEOA board member Ian Anderson. This tragic accident, which happened just before Christmas, hospitalized Ian and his two sons, and killed their wife and mother, Pat. Brian attended the hospital every day, including Christmas, to give support and comfort to Ian and his sons. He opened up his home to accommodate out of town visitors and worked tirelessly to ensure everyone’s needs were addressed. In addition, during this very stressful time, Brian went on to create and lead an Honor Guard of Conservation Officers at Patricia Anderson’s memorial service. Brian is also a remarkable family man, spending much time doing family activities, including travelling with his son’s hockey team and taking his son fishing and hunting. Above and beyond is probably the best way to describe Brian in all aspects of his life. He is the epitome of a good officer, a family man, friend and community member. His commitment to the canine program has made him a respected leader across North America. 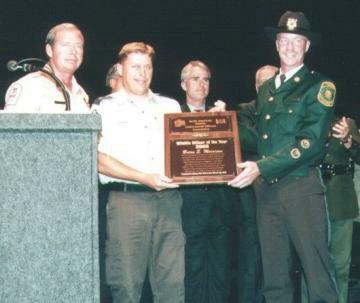 The assistance he has rendered to other enforcement agencies has greatly improved the professional enforcement image of Conservation Officers among many other enforcement agencies. Brian has been recognized by the Premier of Ontario, with the coveted Amethyst Award (1994), awarded for outstanding public service. He has also received accolades from the Federation of Ontario anglers and hunters, the Society for the Prevention to Cruelty to Animals, among others.